Multiple use capabilities for torque check, data processing and quality control. Infrared data output, data memory up to 100 readings, and data processing functions. High working efficiency created by ratcheting function. 2 x AAA Alkaline batteries, 16 hours continuous operation. Applicable to use in the EU region. 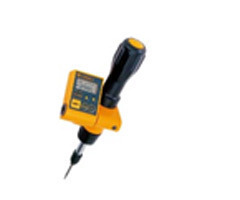 Comply with calibration procedures of ISO6789 Type I Class E.
Standard bit, 6.35 HEX is available. The handle of STC50CN has finger touch structure, difference shape from the other STC models. 0.5~5.0sec. adjustable by 0.5 step.